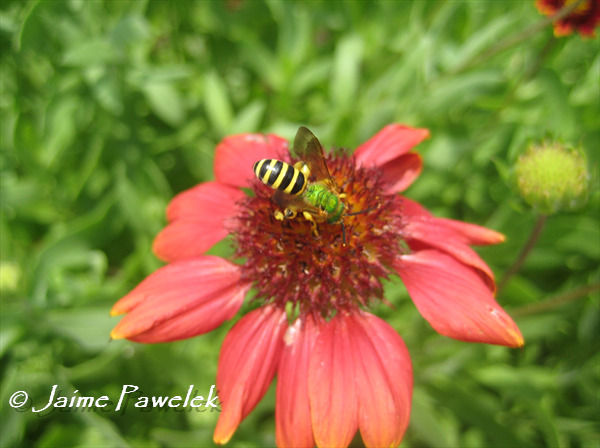 Male metallic green sweat bee on blanketflower. Florida is home to many bees in this diverse group (60+ species). They range in size, color and behavior. The metallic green sweat bees (Augochlorella, Augochloropsis, Augochlora, and Agapostemon spp.) stand out the most with their flashy green bodies dazzling you as they dance from flower to flower. 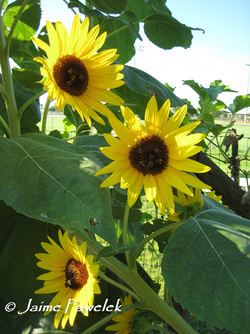 These are the easiest to pick out in this group and some of them are very common in natural and urbanized areas. The colors among these bees can vary slightly from bright green, to a brassy yellow and even bright blue in some areas! Most of the metallic green sweat bees can be seen almost the whole year as well, starting in February and March and going until November and even December in some areas if it stays warm enough. 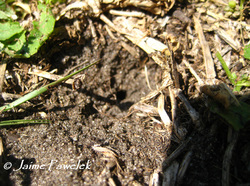 Ground nest of green sweat bee. Many of the metallic green sweat bees nest in the ground and are solitary nesters, although it is not uncommon for females to share their nest entrance with other females. The main burrow entrance will be shared, but once underground the burrow will branch off for each of the females. The picture on the right shows a ground nest of one of the common green sweat bees (Agapostemon splendens), which was found under a citrus tree in the grove at Washington Oaks Gardens State Park. The dark hole in the center of the photograph is the nest entrance. 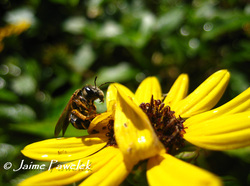 Sweat bee on dune sunflower. Not all sweat bees are brightly colored though, most are actually inconspicuous brown and black bees smaller than a grain of rice. Some are so small that they aren't even noticed as they visit flowers, but what they lack in size they make up in numbers. These non-metallic sweat bees include those in the genus Halictus, Sphecodes, and Lasioglossum. Lasioglossum is a very diverse genus of bees, upwards of 40 species in Florida. These sweat bees are even smaller than the rest and often look like ants with wings! Sphecodes actually parasitize bees in the Halicitidae family and often have some red coloration on their bodies. There are only a few Halictus species in Florida, but by far one of the most common is Halictus poeyi, (seen on left) which can be found throughout Florida at all times of year. Clusters of female sweat bees visiting sunflower.